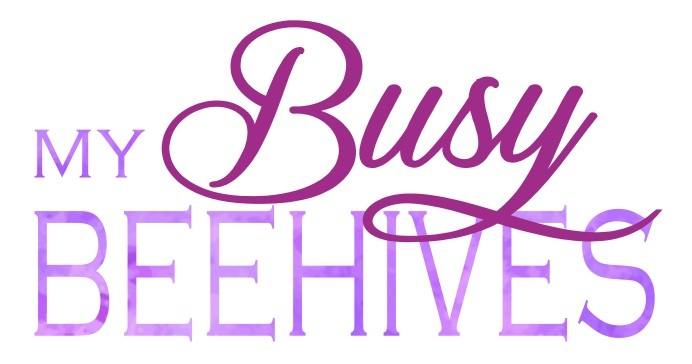 My Busy Beehives...: Host an Ornament Exchange Party...3 Ways! 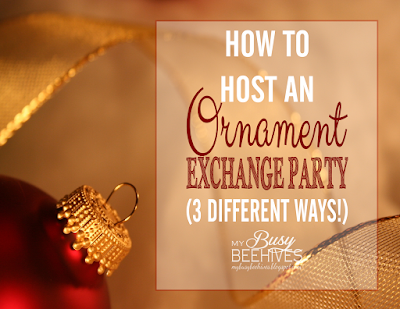 Host an Ornament Exchange Party...3 Ways! One of my favorite things to do every year is to look at all the ornaments in our collection and remember where I was and what we were doing when we received each one. It's like opening a little time capsule every December! If you are like me, and you have a love for ornaments, you may want to consider hosting an Ornament Exchange. You may be looking at the date of this post and thinking, "Why are you talking about Christmas in October? I've got plenty of time..." But planning a party takes a little bit of time and preparation, and now is the time to get started, especially if you want to host a homemade ornament exchange. One of the most important steps is to pick a date. I usually recommend early December or late November since the end of year gets really busy with parties and school events. Once you have a date selected, you need to decide what type of ornament exchange you'd like to host. Invite your friends and ask them each to bring an ornament to exchange. You might specify a certain theme (like a snowman, nativity, or red/green theme). It might also be a good idea to set a reasonable price limit so that somebody doesn't bring a really expensive ornament and leave with a dollar store special. The actual exchange can be done several ways. They can be exchanged white-elephant style, OR you can have each guest draw a number and then pick an ornament in the order they drew. TIP: You might consider asking your guests wrap the ornaments before arriving and exchange them sight-unseen. Just like your friends' personalities, all ornaments are very different. What one person finds beautiful, another finds tacky. Hopefully your guests are mature enough to be gracious, but it only takes one thoughtless remark to cause hurt feelings. No one wants to have brought the ornament that nobody seems to want, and as host, you don't want any of your guests to be offended. Exchanging and having just one reveal of all the ornaments at the end, can avoid a lot of hurt feelings. Follow the same guidelines as above, but ask that each guest bring a homemade ornament. Personally, I prefer the homemade ornaments, as they have a little more personality and every year as you place the ornament on your tree you will be reminded of the person who made it. It can be a great way to remember loved ones. This method takes a bit more preparation, but in my opinion, it is so worth the effort! Basically, instead of only bringing one ornament to exchange, each guest will bring one for each person attending the party. You will need to start your prep work a few months in advance, like in September or October to give each person enough time to gather materials and craft their ornaments. First, consider how many people you want to invite. 10-15 people (or less) is probably a pretty good number, since it can get really expensive and time-consuming to make the ornaments. One easy way to do this is to send out an "are-you-interested-in-participating?" e-vite with details and ask your friends to commit via their response. You really can't have any maybes, because you need a final head count so you know how many ornaments to tell each guest to make and bring, so set a need-to-know-by date on the e-vite. Once you have your final head count, send out another invite to just those who are participating with the final details. Be sure to plan on food/snacks, good music and decor. 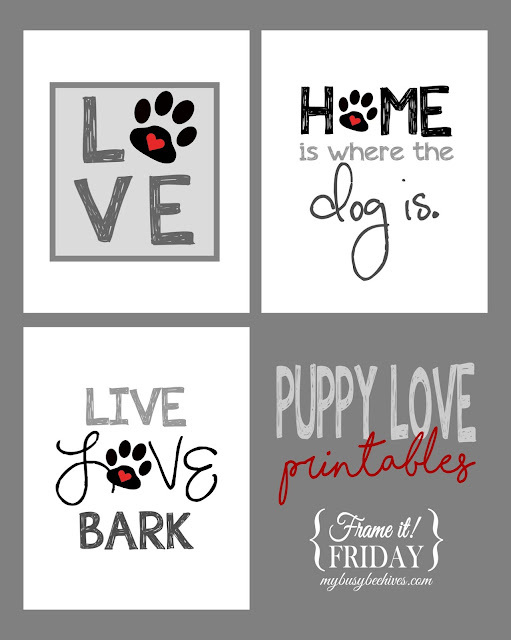 Luckily, if you've already decorated your home for the holidays, you're all set! The night of the party, exchange and enjoy. I usually have each guest show their hand-made creation and tell us how they made it. Also, be sure to have empty gift bags available for each guest to take their newly-acquired ornaments home. TIP: If you're like me and you really can't bear to leave anyone out, go ahead and invite as many people as you want, but then just assign a number of ornaments to each guest. I once hosted a party with over 30 guests, but asked each friend to bring just 10. Unfortunately, not every guest will get to leave with every ornament, but they did receive 10 new ones, which was still good! I just purchased gift bags and randomly selected 10 ornaments for each bag, and then randomly gave the bags out. Some trading of ornaments occurred among a few of the guests, so they could get their favorites from the night, but at that point it was out of my hands, and nobody had to "bid" on any of the ornaments. Ornament Exchange... I have such creative friends!